TOTAL FLANKER...a rugby blog: Twelve months to save international rugby? This week’s warning from World Rugby’s vice-chairman Agustin Pichot that international rugby game is under threat should be taken seriously by all involved. 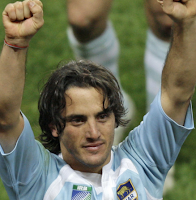 Pichot wants unions and clubs to agree a new 10 year global calendar before the 2019 World Cup in Japan – in other words, “Rugby I love you, but we only have 12 months left to save the game”. (Bonus points for spotting the movie reference there 😀). The fact that Premiership clubs this week felt confident enough to turn down a £275 million takeover bid shows that the club game in the northern hemisphere is, at least on the face of it, in rude health. Many international unions, however, are facing financial difficulty, and the steady drip, drip, drip of players from the southern hemisphere to the north is in danger of becoming a torrent – particularly if (as seems likely) further huge investments are made into the club game. And let’s face it, any organisation investing vast sums into, say, the Premiership, is hardly going to be thrilled at the prospect of losing its key assets – the international players – for extended periods of the season. It’s therefore easy to understand Pichot’s fears that the international game is in jeopardy. And yet, conversely, international rugby remains the game’s showpiece and the club owners must know that the interest generated by the international game is ultimately what drives domestic rugby, both in terms of TV coverage and bums on seats. In the middle of this, of course, are the players – pulled from pillar to post and flogged both physically and mentally by the game’s stakeholders pulling in opposite directions. Pichot is right. It needs sorting out, and sooner rather than later.